Maybe someone already found a configuration for this to handle? Building on the original tweet from @rustyshelf, and illustrated answer from iDevzilla, here's a solution that silences the noise from the simulator without disabling NSLog output from the device. OS_ACTIVITY_MODE didn't work for me (it may have been because I typo'd disable as disabled, but isn't that more natural?!? ), or at least didn't prevent a great deal of messages. So here's the real deal with the environment variables. // require any specific value; rather, it just needs to exist). // specifically want it unset. // Let our parent class do the real launching. So setting OS_ACTIVITY_DT_MODE to "NO" in the environment variables (GUI method explained in Schemes screenshot in main answer) makes it work for me. As far as NSLog being the dumping ground for system messages, errors, and your own debugging: a real logging approach is probably called for anyway, e.g. https://github.com/fpillet/NSLogger . Drink the new Kool-Aid: http://asciiwwdc.com/2016/sessions/721 https://developer.apple.com/videos/play/wwdc2016/721/ It's not surprising that there are some hitches after overhauling the entire logging API. NSLog is now just a shim to os_log in most circumstances. [Edited 22 Sep]: I wonder what "release" and "stream" do differently than "debug". Not enough source. To stop the Xcode 8 iOS Simulator from logging like crazy, set an environment variable OS_ACTIVITY_MODE = disable in your debug scheme. ** EDIT 8/1/16: This has been acknowledged in the release notes for Xcode 8 Beta 4 (8S188o) as an issues still persisting. Please find the below steps. Select the Run option from left side. For more information please find the below GIF representation. 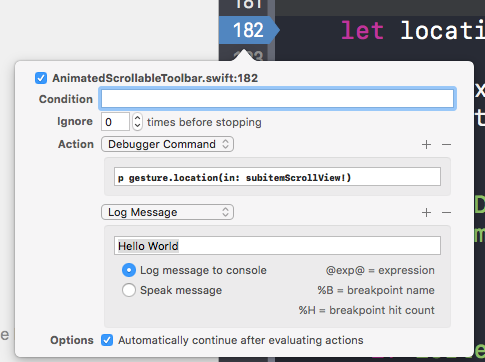 My solution is to use the debugger command and/or Log Message in breakpoints. This is related to a known issue with logging found in the Xcode 8 Beta Release Notes (also asked an engineer at WWDC). There is currently no workaround available, you must wait for a new version of Xcode. Alright. There seems to be a lot of commotion about this one, so I'll give y'all a way to persist it without using that scheme trick. I'll address the iOS Simulator specifically, but this also might need to be applied for the TV Sim as well which is located in a different dir. The problem that is causing all of this stuff are plists located within the Xcode directory. There is a process that gets launched called configd_sim when the Sim starts that reads the plists in and prints debugging information if the plists specify they should be logged. If you are playing around with a beta, take note that the dir will be different. You will see numerous plists in this directory. Now, build and run your application and observe the logs. You are looking for the content immediately followed by the subsystem: part. It is the name immediately following this that represents the corresponding problematic plist. From there, either modify the plist to knock out the debugging [Level] key/value which is a dictionary containing the "Enable" => "Default" key/value... or just simply delete the plist. Note, that you will need to be root to do either of these since they're located in the Xcode application. the plutil -p command might be of use to you as well. i.e. This is no longer an issue in xcode 8.1 (tested Version 8.1 beta (8T46g)). You can remove the OS_ACTIVITY_MODE environment variable from your scheme. This will dump out all of the debug data and also your NSLogs. In Xcode 10 the OS_ACTIVITY_MODE variable with disable (or default) value also turns off the NSLog no matter what. So if you want to get rid of the console noise but not of your own logs, you could try the good old printf("") instead of the NSLog since it is not affected by the OS_ACTIVITY_MODE = disable. 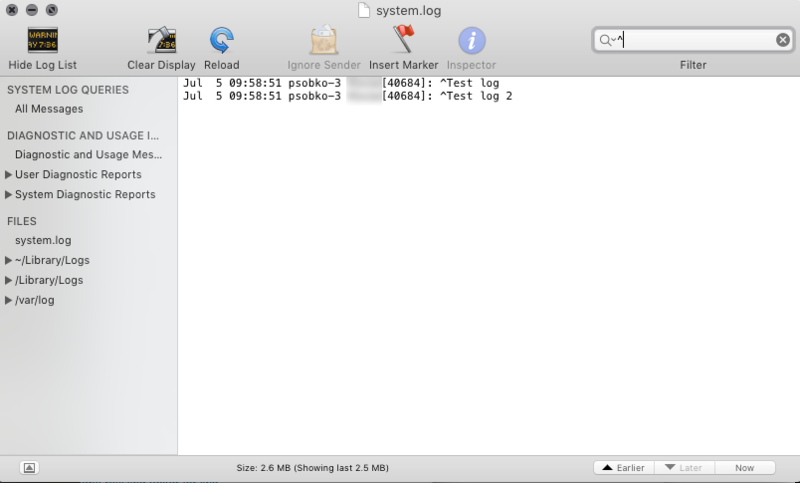 But better check out the new os_log API here. Not the answer you're looking for? Browse other questions tagged ios xcode logging xcode8 ios10 or ask your own question. How to remove verbose network messages from xcode?